An international campaign is underway to defend the rights of the great whistleblower Julian Assange and stop authorities in the UK and the United States from putting him in prison. Assange, the founder and editor of WikiLeaks --- which over the past 15 years has published secret files exposing US war crimes in the Middle East, US political corruption, frightening new cyber warfare systems used by US intelligence and the inner workings of the notorious Guantanamo Bay prison ---- has been holed up in the Ecuadorian Embassy in London for six years after being granted political asylum by Ecuador. Though isolated and cut off from the outside world, Assange was protected from arrest by UK and US authorities who want him for various alleged crimes, most importantly the illegal release of classified information. But Assange’s safety is now in doubt. The left-leaning government in Ecuador of Rafael Correa , which granted Assange asylum, has been replaced by a more conservative government led by Lenin Moreno, which seeks closer relations with the United States. Officials of Moreno’s administration have indicated that Assange may be forced to leave the embassy in London. If Assange has to leave the embassy, he will be immediately picked up by UK officials who said that they will turn him over to the United States. Atty. Gen. Jeff Sessions said he considers arresting Assange “a priority,” and his office has reportedly drawn up espionage charges. If he is tried and convicted, Assange could face life in prison or even the death penalty. Activists from around the world are holding rallies and protests to spotlight the danger that the WikiLeaks publisher now faces and are demanding that UK and US officials drop any plans for prosecuting Assange. Demonstrations have taken place in Britain, Australia and Washington, D.C. Smaller protests also took place in New York and L.A. 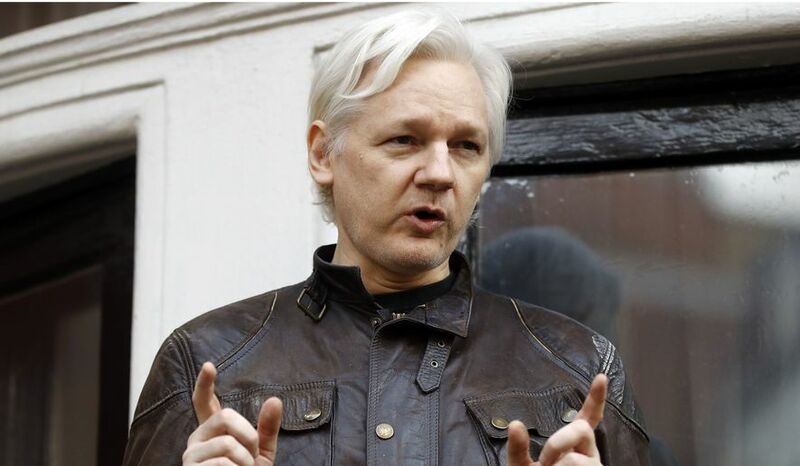 Supporters of Assange, who is Australian, say that if governments in Britain and the US can put the WikiLeaks founder behind bars it will be a severe blow to freedom of speech --- undermining the right to publish information critical of those in power. Advocates for Assange are demanding that the government of Australia step in and exercise its diplomatic power to protect the whistleblower from threats made by the British and American governments. They are asking that the WikiLeaks leader be allowed to return to Australia and that the Australian government reject any demands from the US for his extradition. The famed journalist John Pilger also addressed the Sydney rally, which was attended by several hundred people, according to a story in the World Socialist Website. “This would be achieved, they wrote, with threats of exposure and criminal prosecution and an unrelenting assault on reputation. The aim was to silence and criminalize WikiLeaks and its editor and publisher. It was as if they plan the war on a single human being and on the very principle of freedom of speech,” Pilger said. Pilger had previously criticized the left in both Britain and the United States by not standing in support of the Assange. In a statement delivered by Dennis Bernstein to the Left Forum in New York in early June at a panel entitled “Russia-gate and WikiLeaks,” Pilger decried the silence of many on the left. “There is a silence among many who call themselves left. The silence is Julian Assange. As every false accusation has fallen away, every bogus smear shown to be the work of political enemies, Julian stands vindicated as one who has exposed a system that threatens humanity,” said Pilger, who was born in Australia and lives in Britain. In addition to many in the government who have criticized Assange for endangering US military personnel by releasing classified military documents about the Iraq and Afghanistan wars, some on the left have taken issue with Assange in the last two years due to WikiLeaks’ perceived role in influencing the 2016 election and helping Donald Trump win. WikiLeaks was able to secure and then publish emails from the Democratic National Committee in 2016 which showed how the DNC was favoring Hillary Clinton and trying to undermine the insurgent candidacy of Bernie Sanders. Trump was able to use the WikiLeaks revelations to successfully attack Clinton when he campaigned for the presidency against the former Secretary of State. US intelligence officials and others have maintained, without solid proof, that the DNC emails were hacked by Russian operatives and then given to WikiLeaks, since Russia stood to gain by a Trump victory. Assange has insisted that a “state actor” was not responsible for providing the emails. He said that another party, not named, provided the material. It is believed by many that the email material was actually made available by a disgruntled DNC staffer who backed Sanders and wanted to expose how the nomination process was stacked in favor of Clinton. In recent months, Assange has picked up support from a diverse group of writers, lawyers, former intelligence officials and people in arts and entertainment. Among those backing him are Chris Hedges, the Pulitzer prize-winning journalist and author, John Kiriakou, a former CIA official who went to prison for exposing illegal torture practices, former FBI agent Colleen Rowley, Ken Loach, a film director, singer Lady Gaga and actress Pamela Anderson.